I began my orbital tour around the capital three years ago in Dartford, and finally I've reached journey's end across the Thames. And that means Thurrock (or 'Furruck' as the locals call it), a marshy district with a drab reputation... and when the main town's called Grays, that really doesn't help. The majority of Thurrock's 150,000 population live in the southwest quadrant, between the A13 and the river, so that's where I spent most of my time. As usual I attempted to seek out some interesting places I hadn't blogged about before, and the day was less grim than you might have anticipated. Yes of course Thurrock has a museum, because a lot has happened on the low-lying banks of the Thames estuary over the centuries. From mammoths in Aveley to Queen Elizabeth's pre-Armada speech, they're all covered here, plus Anglo Saxon artefacts from the UK's largest ever archaeological excavation at Mucking. 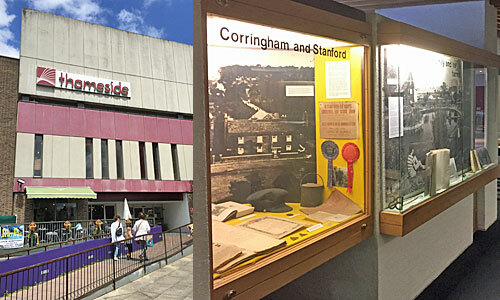 You'll find the museum upstairs in Grays at the Thameside Complex, a very 80s-looking block which also doubles up as the town's theatre, the town's library and the purveyor of cheap coffee and pastries for those who don't venture past the box office. A lot is packed into the cluster of galleries, first historically, then thematically, and finally geographically, with a decent case of exhibits for each of the disparate settlements which make up modern Thurrock. For example there's a fascinating look back at Kynochtown, the village serving the gunpowder factory since replaced by Shell Haven Refinery since replaced by Thames Oilport, and there's another corner focusing on the lost grand mansion at Belhus near Ockendon. Don't expect modern presentation, the labels and panels look like they're about the same age as the building, but they were a damned sight more informative than a shiny push-button 21st century upgrade might be. Open six days a week, it's free to look around. This town used to be called Greys Thurrock, where 'thurrock' is a shipbuilding term and the opener signifies ownership by Sir Henry de Grey, one of King John's favourite courtiers. The town clings to the estuary on the outside of a bend in the Thames, with the majority of older housing to the north of the railway and more of the modern stuff on the low-lying shore. This isn't so much the territory of white van man as white truck man, with the majority of local business being distribution-based, to transfer and/or process goods arriving at Tilbury or the newer docks. If London house prices scare you, Grays is highly commutable and still has decent-sized stock whose six-figure prices start with a 2. The pedestrianised high street runs from the Old Courthouse down to the river, with a level crossing partway down, and a selection of not quite thrilling shops along the way. 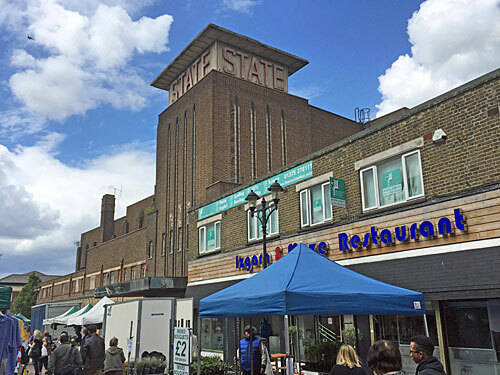 Looming over all is the tower of the State Cinema, an Essex behemoth which itself achieved cinematographic fame when it was used as a location in Who Framed Roger Rabbit. The cinema closed on its 50th birthday in 1988, and has since briefly been a nightclub, but more recently an empty leaking shell with a very uncertain future. Its car park, however, is thriving, having been taken over by an enormous Morrisons which draws the denizens of Grays inexorably within. A lacklustre market up a side alley sells golden delicious, e-cigs and geraniums, while ladies who grew up long ago in East London pick over racks of fancy £10 shoes. Beyond the railway the High Street descends past the parish church to a freshly redeveloped zone housing South Essex College, and almost no old buildings whatsoever apart from a couple of blokey pubs at the very foot. I wanted to walk further but the flood gates were firmly shut, protecting the flats on the waterfront and the cul-de-sacs behind, so instead I headed past the yacht club to the exciting-sounding Grays Beach... which turned out to be a drained swimming pool filled with sand. Stepping up onto the river wall I enjoyed the sweeping estuarine panorama, probably only because the sun was out, from the edge of Tilbury Port past the tip of the Swanscombe peninsula round to the distant QE2 bridge. The Thames is big out here, and immutably grey. It is the most astonishing place to find a medieval church. From Purfleet to South Stifford the landscape to the south of the railway is almost exclusively industrial, right down to the estuary, sprawled with logistics hubs, warehouses and oil depots. Lorries thunder down feeder roads, pylons stride across the former marshes, and if you'd ever wondered where the Daily Mail is printed now its base in Rotherhithe has closed, it's here. Head south from the A126 roundabout to the Co-Op Distribution Centre, turn left into Procter & Gamble's site ignoring the sign saying 'Private Road', then right along the footpath up the side of the Fairy Liquid plant. However wrong it feels, keep walking, and a couple of hundred metres down is a church you know well. St Clement's survives in a small green oasis, which is mostly churchyard, surrounded on two sides by factory premises and on another by the employees' car park. 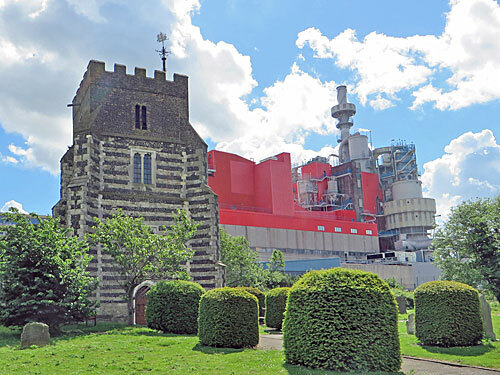 Viewed from one angle it looks like any flint-towered Essex church, but from the front it's impossible to miss the giant red processing plant behind, with tanks and silos and steaming chimney rising into the sky. Inexorably engulfed since the mid 20th-century, the church became redundant in 1977 and was adopted by P&G ten years later, who've reversed the dereliction and restored the interior, plus encouraged wildlife to thrive in the graveyard outside. I briefly met a couple of rabbits. Annoyingly I missed the one weekend a month when volunteers open up and allow the public inside (June 3rd/4th is the next), and I also struggled to take a decent photo into the sun, so I'd recommend visiting in the afternoon rather than the morning. If you haven't yet remembered where you've seen this church before, think back to the 1994 film Four Weddings and a Funeral, because this is where the funeral was shot. John Hannah reads Auden's Stop All The Clocks inside, and then a pivotal conversation takes place at the front gate, with industrial chimney duly billowing in the background. The scenes in which the family set off to the church were filmed at the crest of a dead end in West Thurrock, whose pre-war pebbledash terraces are now bedecked with sequential satellite dishes. 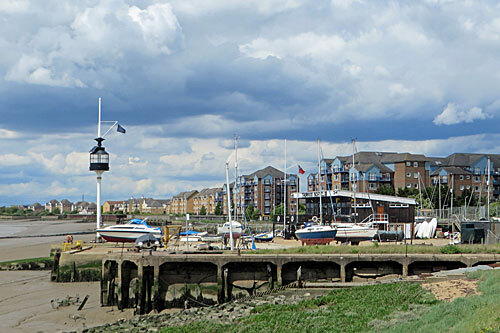 And whilst it is possible to follow a short path down from St Clement's to the Thames, Hugh Grant's waterfront scenes were actually filmed in Grays because the backdrop was better. I followed the path through a narrow strip of mostly nettles to reach a couple of benches on a raised wall overlooking the river. A large cruiser sped by, cranes drooped, mud rippled. 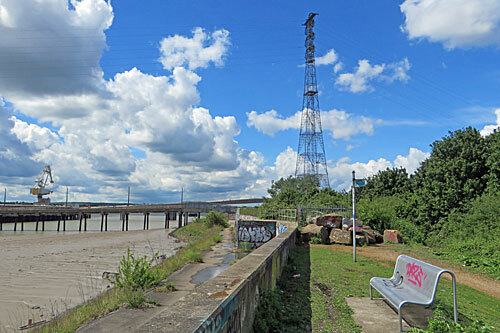 This is the sole break point from a truly remote footpath which runs three miles along the waterfront from Purfleet, and which I really want to walk one day, but I think best in company rather than alone, and preferably when the tide's not in. A tattooed jogger appeared from nowhere, scrambled up over some rocks and headed off along the wall, so it must be possible. And yes, that is the tallest electricity pylon in Britain rising close by, one of a pair comprising the 400 kV Thames Crossing, transferring power 600ft up to a similar mast in Swanscombe. I wrote about that in 2014 when I started my round-London circuit in Dartford... and this is an excellent connection to confirm, job done.